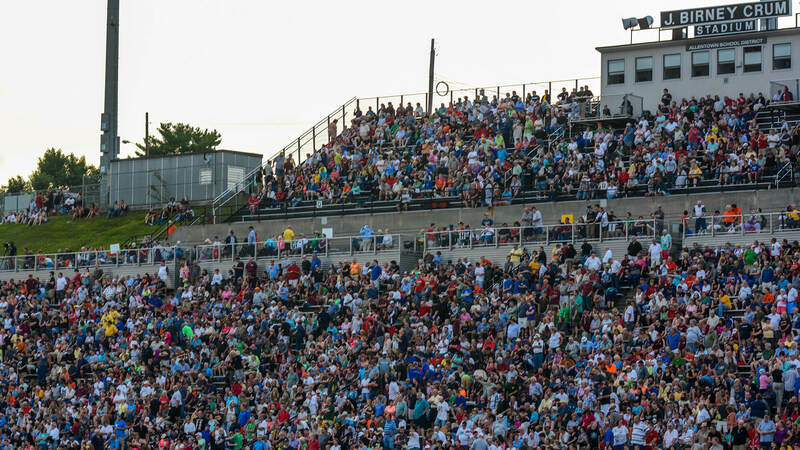 All 22 of Drum Corps International’s World Class corps will converge on the same locale for the last time before the DCI World Championships, when the DCI Eastern Classic heads to iconic J. Birney Crum stadium in Allentown, Pennsylvania this weekend. The DCI Eastern Classic is split over two days, but you can still catch all the action on DCI Live! The event will begin at 6:30 p.m. ET/3:30 p.m. PT on both Friday, July 31 and Saturday, August 1. 10 World Class corps will compete on Friday, while the remaining 12 World Class corps will enter the fray on Saturday. These DCI Live! webcasts will be available for viewing on desktop computers, with mobile streaming available exclusively through the DCI.org iPhone and iPad app, or the DCI.org Android app. The webcasts can both be accessed as part of a season-long subscription package or by pay-per-view. • The Blue Devils are a heavy favorite to take the first day; the question is, will their score be high enough to match up with the powerhouses who take the field on Day 2? While the split competition is a unique tradition for Allentown, it will certainly make predicting the end of an already unpredictable season very difficult. • There is a decidedly western tilt to the first day of competition in Allentown. In addition to the Blue Devils, the Santa Clara Vanguard, Blue Knights, Academy, Mandarins and Cascades will be among the first batch of performing corps. For a bit of fun, pull out the results from early-season West coast shows and see just how far these corps have come since mid-June. • Will the Cavaliers catch up? After a bout with illness that forced the corps to pull out of last week’s regional event in Atlanta, the corps has been working hard to regain the ground it lost to the unfortunate circumstances. With the Blue Stars breathing down their necks, the Cavaliers will look to draw closer to the Blue Knights, whom they were close to catching before last week. • After the competition is finished, stick around for two fantastic encore performances from FREE Players and Cadets 2. Founded in 2010, FREE Players is a drum corps composed entirely of musicians from the special-needs community. Featuring a drum line, color guard and front ensemble, the group has performed throughout Long Island and the surrounding region. DCI fans will definitely want to stay in their seats to watch this inspiring group perform. • If you’re looking for a dark horse on Saturday, look no farther than the Bluecoats. The Canton, Ohio corps has made several tweaks of their own to their closing sequence, garnering a big reaction from the crowd in Atlanta last weekend. Are there more changes on the way? You’ll have to watch DCI Live! to find out, but it’s clear this corps is not going to sit idly by while the Cadets, Blue Devils and Carolina Crown have all the fun. Remember, the Bluecoats have already recorded wins over both the Cadets and Carolina Crown this season, and less than a point back from these corps in the standings, there’s no reason why history can’t repeat itself. • If anyone is going to make a move to break into the top 12, Allentown is where it starts. The Colts and Troopers have both been sitting around two points behind 12th place, but could easily make up that ground within a week. The Colts, in particular, have been surging as of late, pulling ahead of the Troopers for the first time this year in Atlanta and moving into 13th place in the standings. 13th is familiar territory for the Dubuque, Iowa corps--no corps has finished in 13th more often in the past 10 years. Will this be the year that the Colts return to Finals night for the first time since 2007? • While there aren’t as many West Coast corps performing on Saturday as there were on Friday, fans will be treated to the next installment in what has been an intense competition between the Oregon Crusaders and Pacific Crest. The corps have been going back and forth throughout 2015, with Pacific Crest pulling ahead in two recent competitions for the first time since July 8. When the Mandarins (who perform on Friday) are thrown into the mix, this group of corps have had one of the most entertaining and competitive rivalries of the season. Who will have the edge heading into World Championships Week? Find out this weekend on DCI Live!